Sick of drab, boring blades? 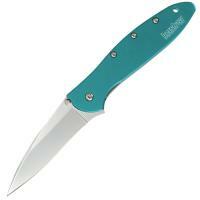 Kershaw's famous Leek folding knife now comes with a bright, eye-catching teal handle. Its anodized finish is fade and scratch resistant, ensuring it will look good for as long as you need it. The modified drop point 3 inch blade gives the knife a long cutting edge for efficient slicing and plenty of control at the tip for precision work. Its high-performance Sandvik 14C28N stainless steel holds an edge beautifully and comes razor-sharp and ready for action right out of the packaging. Kershaw's ambidextrous SpeedSafe® assisted opening system is a safe, quick and easy way to access your blade. Simply pull back on the flipper, or push down on the thumbstud. The locking liner keeps the blade secure while open or deployed, and the added Tip-Lock slider keeps the blade closed between use. Conveniently carry the Leek with its reversible pocket clip.